It is one of the greatest surviving textiles from the European Middle Ages; a rare masterpiece of French art. Travelling for only the third time outside France since they were designed in Paris circa 1500, the six magnificent Lady and the Unicorn tapestries can be viewed exclusively at the Art Gallery of New South Wales in Sydney in 2018. On loan from the Musée de Cluny – Musée national du Moyen Âge, Paris, The Lady and the Unicorn is often referred to as the ‘Mona Lisa of the Middle Ages.’ Considered a French national treasure, it is the number one attraction at the Musée de Cluny, one of Paris’ most-visited museums. 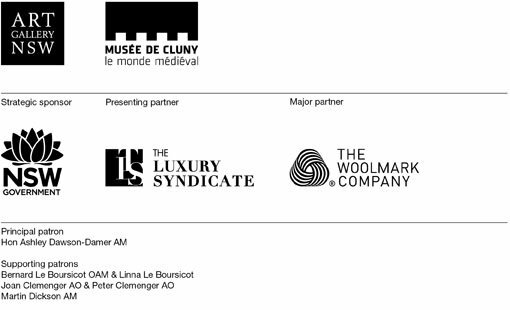 Art Gallery of New South Wales Director Dr Michael Brand said it is an honour that the Musée de Cluny is lending The Lady and the Unicorn to the Art Gallery of New South Wales. “The Gallery has forged strong links with art museums in France including the Musée de Cluny. The tapestry series is exceptional, and as one of the greatest surviving artworks of its kind, it’s a real coup that it’s coming exclusively to Sydney. It is unlikely to travel from Paris ever again,” Dr Brand said. Woven in wool and silk to a French design, the majestic tapestries comprise six entrancing works that together, due to their significant scale, span over twenty metres in length. Five of the tapestries depict the five senses, with a sixth representing the heart, or understanding. Within the tapestries a lady flanked by a lion and a unicorn is surrounded by a fantastical world of animals, trees and flowers. NSW Minister for the Arts, Don Harwin, said he expects the thousands of visitors who view the tapestry series at the Art Gallery of NSW in the coming months will, like so many before them, be enchanted by their tranquil scenes and mysterious meanings. “ The Lady and the Unicorn tapestries are remarkable and rare and I’m delighted that the NSW Government has assisted the Gallery to bring this masterpiece of Western medieval art to Sydney,” Harwin said. Art Gallery of New South Wales Deputy Director and Director of Collections, French-born Maud Page, said the significance of the tapestry series in the history of French art is well known and documented. “The tapestries are universally revered and are a portal to the past, but the lasting beauty of The Lady and the Unicorn is that it retains its mystique and its freshness after centuries, still inspiring awe in viewers today,” Page said. “I first saw The Lady and the Unicorn when I was a young child. I was mesmerised by its exquisite figures and enchanting animals, and the scenes in the tapestry have stayed with me ever since,” Page added. The tapestry series has only left Paris twice previously – to New York in 1973-74 and Japan (Tokyo and Osaka) in 2013. Director of the Musée de Cluny, Elisabeth Taburet-Delahaye, said she is delighted to see the work travel to Australia. “ The Lady and the Unicorn seduces us by the beauty and balance of its compositions; by the intimate and secret atmosphere that is created; and by the joyful harmony of the flowers strewn on their red grounds. “The six tapestries also intrigue us, with their silent scenes played out by female figures and the presence of a mysterious unicorn watched by a debonair lion. They have, since their acquisition by the Musée de Cluny in 1882, inspired novelists, poets and philosophers, and have moved many less celebrated visitors,” Taburet-Delahaye said. Each tapestry, with its jewel-like millefleur (‘thousand flowers’) background represents each sense – the first being touch, in which the figure of the lady holds the unicorn’s horn; taste, in which the lady feeds a bird; smell, in which she holds flowers; hearing, in which she plays music and sight, in which she shows the unicorn his reflection in a mirror. 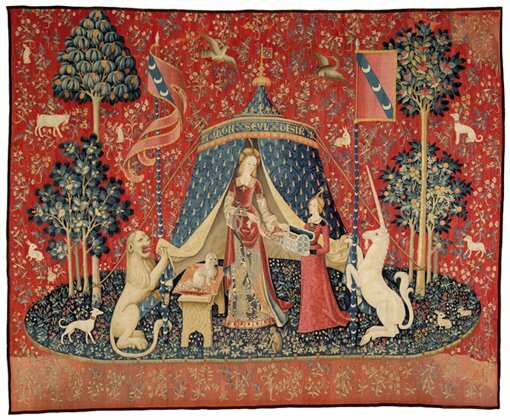 The sixth tapestry includes an enigmatic text that reads, ‘Mon seul désir,’ or ‘My only desire.’ It depicts the lady emerging from a tent, held open by the lion and the unicorn. For centuries The Lady and the Unicorn has fascinated writers, musicians and artists. The literature of George Sand (the author credited for ‘rediscovering’ the tapestries); the poetry of Rainer Maria Rilke; Jean Cocteau’s drawings, sets and costumes for the Ballet Russes and, more recently, Tracy Chevalier’s Lady and the Unicorn novel were all inspired by the tapestries. Such is their fame that even young people might recognise them, as facsimiles of the tapestries grace the walls of the Gryffindor house common room in the Harry Potter movies. With its discovery spaces and tailor-made digital experience, The Lady and the Unicorn exhibition at AGNSW will allow visitors an intimate encounter with one of Western art’s greatest surviving treasures. Programs ranging from hands-on textile and mindfulness workshops to poetry performances responding to the tapestries will reward experience-seekers, art and history lovers alike. This exhibition is made possible through a generous and exceptional loan from the collection of the Musée de Cluny – Musée national du Moyen Âge, Paris and the support of the NSW Government through its tourism and major events agency, Destination NSW. Due to popular demand, tickets are now dated and timed. You need to specify a date and time when booking.